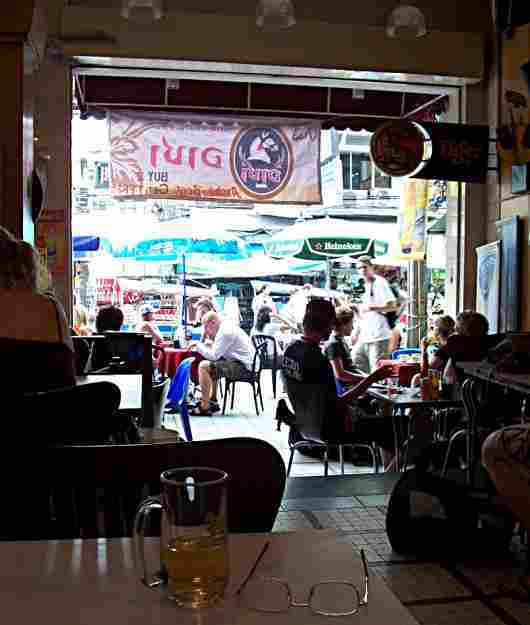 Khao San Road, KSR, Bangkok, backpacker heaven. Khao San Road - backpackers mecca cold beer and cheap travel tickets. 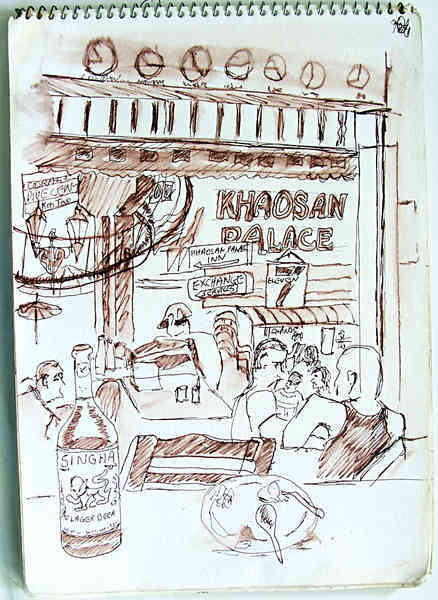 I have got to be fairly relaxed to draw, and that's why a lot of my sketches feature bottles of beer on the tables in the foreground. Khao San Rd Bangkok. Singha beer at $5.50 a big bottle. I have never actually stayed in or around KSR, but there is something about the place, in spite of it's seedy reputation, that draws me back, particularly on hot afternoons. Those dark interiors of the sidewalk cafes are very tempting. Being a sixty five year old backpacker with a slightly dodgy back, I travelled around with what most would consider a day pack. That is a small pack with about 15Kg of my total possessions. Sat in the dark interior I would observe my fellow tourists strolling by, the newly arrived ones trudging sweatily with huge packs, some with front and backpacks. Musing over a longneck of Singha I would think, "why do they do It, why carry such bulky and heavy packs about"? The old joke comes to mind, "Why does a dog lick it's balls"?